OK, so I think it’s best if I set the scene a little first. Over the last 4 years or so I’ve made numerous, almost weekly, trips to London as part of my job. This involves me spending two/three days away from home – which, for reference, is near to Alton Towers and so approximately 175 miles north of London – hence why London is kind of a second home, albeit that there have been a number of homes (AKA hotels). Last week was the first week of Wimbledon, and as usual a number of weeks ago I got an email from our travel services team saying that for this reason hotels would be at a premium and you should book early – which I did. 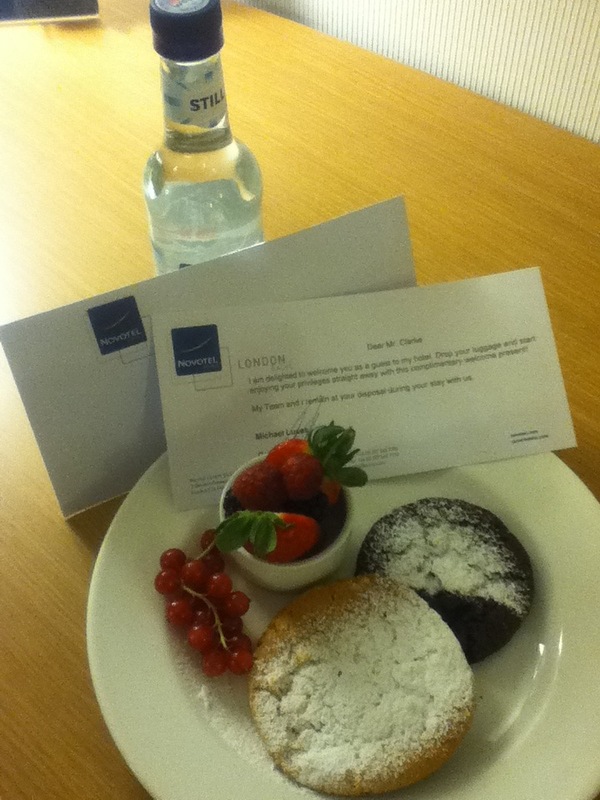 However the hotels I would normally use – due to their great service (see welcome gift below) – had no rooms available. And so it was that I booked 2 nights in the Crowne Plaza London Docklands (CPL). Up until last week I’d never stayed in the CPL, this despite it proving popular with a number of colleagues who have used it on a regular basis. So my expectations were quite high based on what they had said. The main part of this story actually starts on Sunday evening, whilst watching USA v Portugal. It must have been just after half-time (approx 00:10 local time for me), when I heard and odd sound from upstairs. So I paused the TV and looked upstairs to see my son standing there, and he promptly uttered those dreaded words “I’ve been sick”. This then involved cleaning him up, changing bed sheets etc before we were able to get him back to bed. Now as I was staying up late to watch the football, this wasn’t too bad, apart from the fact that I knew my alarm was set for 05:00 Monday morning (to make sure I had enough time to get breakfast etc and get to train station). But as any father would do, I stayed up to ensure that my son was OK – not just to watch the football – meaning my head hit the pillow at around 03:00. For those who are quick at Maths, this gave me around two hours sleep – 2 hrs 18 mins to be exact if you include hitting snooze a couple of times. So now we are on Monday, I’m at work and feeling particularly worn out towards the end of the day. My boss looked at me and said “You look a little tired [understatement], why don’t you get off early?” And so it was that I left around 16:00 to go and check in at my hotel. Being of tired mind the journey did not start well, as I missed the stop on the DLR where I had to change – but this simply meant going to the next one and coming back, not a biggie but a small irritation all the same. Eventually arriving at the hotel, first impressions were good. Nice bright open reception area, reception desk manned etc. So I went to check in. And there you have it – the worst experience I’ve ever had travelling to/from London (even worse than cancelled trains & day long journeys). Given my drained demeanour this was possibly the worst service I’ve ever had. There was no empathy shown, no offer to phone other hotels in the chain, not even a “I’m really sorry” – for all I knew they were happy for me to sleep amongst their bins round the back. So this left me a couple of hundred miles from home, with nowhere to stay, and (remembering it was Wimbledon week) trying to find a room somewhere would be like a blunt pencil – pointless. That said because I’d left work early, there was a glimmer of hope. I was able to contact the booking team to check the details with them. They confirmed that the booking was still live, and the hotel were wrong. So the [very] helpful guy on the phone phoned the hotel on my behalf, and came back a few minutes later to confirm that the hotel said they’d received a cancellation via “the internet”, but he’d managed to secure a room. Not sure how he’d managed to do this given I was told there weren’t any, but I was massively relieved and eternally grateful to him. It was about 45 mins later that the phone in my room rang. It was the hotel front office manager. A short conversation followed, in which they apologised for what had happened – but did not provide a reason as to why – saying that they had seen my tweet and asked what they could do to put it right. I simply replied “That’s not for me to decide”, at which point they offered a free drink and I said “That would be nice and a good start”, and so it was that a rather polite chap turned up at my door about 10 mins later with my chosen drink. And that was it, no follow up, no further contact. That is apart from receiving a reply via twitter to DM them and that a manager would be in touch – but this was 1 hr 15 mins after my tweet and after the manager had already called. I could have tweeted again, but decided not to – especially because their twitter response took so long. If they think that a free drink would suffice, and somehow right the wrong, then clearly they have a long way to go in understanding how I felt when told about the cancellation. This story could have ended so much differently, if only they’d taken time to understand the situation that having no room meant for me – a situation which they were responsible for. They even had two bites at the proverbial cherry to put it right. If I’m being honest, I’m not sure what they could have done. But being on my side, understanding the impact that this had on me emotionally, and making an effort would have helped (would they have done anything if I hadn’t tweeted?). As it stands, to quote from NPS speak, they now have a detractor. One that has now recounted this sad tale on a number of occasions. Sorry Crowne Plaza, as you can probably guess I won’t ever be staying at CPL again. The sadder thing is that given the lasting impression that this has made I don’t think I’ll stay in any of your hotels again.